Aaron Murray celebrates Georgia’s win over LSU. This game is a barometer of how far the college game has changed in the last two years. Two years ago this would have been a 13-10 defensive struggle. Two years later, the teams combined for 85 points and 943 yards. Both teams lost a lot of talent to the NFL and were forced to play young players on that side of the ball. They both have young talent, but defense is no longer the strength of either team. As the game progressed, it was obvious that the last team with the ball had a chance to be the winner. This game was also a testament to how far LSU quarterback Zach Mettenberger has progressed. LSU hired former NFL head coach and offensive coordinator Cam Cameron to tutor Mettenberger and the quarterback has flourished under Cameron’s guidance. Georgia received the opening kickoff and senior quarterback Aaron Murray moved his team right down the field. Mixing runs from super sophomore running back Todd Gurley and Murray’s passes, the Bulldogs went 75 yards in 8 plays. Murray connected with his junior receiver Michael Bennett to take the 7-0 lead. The Tigers got their first chance and they also capitalized. Mettenberger was able to find senior receiver Kadron Boone for a 48 yard touchdown. It was only the second catch of the year for Boone. On Georgia’s next possession, the Tigers confused Murray by dropping defensive tackle Anthony Johnson into coverage and Johnson made the interception. The Tigers took advantage of the turnover when Mettenberger again connected with Boone, this time from 4 yards away to take a 14-7 lead. Georgia quickly tied the score on their next drive. They took advantage of a 23 yard run by Gurley then Murray threw a 25 yard touchdown pass to junior receiver Chris Conley to tie the score at 14. The two defenses made adjustments and neither team scored again until midway through the 2nd quarter. Using mostly the running of Gurley and Keith Marshall, the Dawgs moved the ball to the LSU 7. The drive stalled and Georgia settled for a 24 yard field goal to take a 17-14 lead. The game continued to go back and forth as Mettenberger used his arm to move his team into scoring position and got a field goal of their own to tie it at 17 all. With 3:51 in the half, Georgia got one last scoring drive. They put together a great drive that not only got them the score, but it didn’t give LSU time to respond. Murray completed passes of 10, 28 and 24 yards to get his team to the LSU 17. Two Keith Marshall runs got them to the Tigers 1 yard line and from there Murray sneaked it in and the Dawgs took a 24-17 lead into the half. The Tiger offense is normally built around the power running game. They like to pound away at the defense then strike with play action passes. The Bulldogs did a good job containing the LSU running game in the first half, but they still only had a 7 point lead. As the 3rd quarter started, the Tigers were able to somewhat get the running game going. Sophomore running back Jeremy Hill had runs of 11 and 16 yards and the Tigers drove down to the Georgia 22 yard line. The Dawgs held and LSU converted on a 39 yard field goal to cut Georgia’s lead to 24-20. On the Bulldogs next possession, they capitalized on a 22 yard completion from Murray to Keith Marshall, then a 33 yard completion to Conley to set up a 55 yard field goal attempt. Sophomore kicker Marshall Morgan, kicking in only the second game of his career came up big by nailing the 55 yarder with ease. The kick put Georgia back up by seven at 27-20. On the Tigers next possession, Mettenberger and junior receiver Jarvis Landry connected for two big plays. The first was a 26 yard strike which put them on the 50 yard line. Six plays later they connected again for 39 yards and a touchdown to tie the game at 27. On Georgia’s next possession the Tigers defense stepped up and got a stop, but Tiger receiver Odell Beckham fumbled the punt which was recovered by junior safety Connor Norman, giving the Dawgs the ball at the LSU 20. Three plays later Murray connected once again with Bennett for a 21 yard TD and Georgia was back on top 34-27. The quarter ended with the Bulldogs up by seven points. On the first drive of the 4th quarter, the Tigers used a 17 yard pass from Mettenberger to Beckham and a 25 yard pass to Landry to set them up at the Georgia 6 yard line. Two plays later, junior running back Kenny Hilliard took it from 2 yards out to tie the game 34-34. Murray then took Georgia on an 11 play drive that covered 55 yards. They used a mixture of runs and passes and a roughing the passer penalty to move the ball to the Tiger 20 where the defense stiffened. The Dawgs settled for a 38 yard field goal and a 37-34 lead. LSU responded with a very efficient drive. Mettenberger completed 25 and 27 yard passes to Beckham and 14 and 12 yard passes to Landry to get them inside the Bulldog 10 yard line. Jeremy Hill took it over from 8 yards out and the Tigers had a 41-37 lead with 4:14 left. As he did all day, Murray responded. The Bulldogs moved to the LSU 25 yard line and then Murray connected with sophomore receiver Justin Scott-Wesley for the touchdown. The touchdown for Scott-Wesley made up for some earlier drops and gave the Dawgs a 44-41 lead. LSU had one chance left with 1:47 left, but Georgia unleashed their pass rush. Mettenberger was sacked on the first play of the drive by freshman linebacker Leonard Floyd. The Tigers were able to overcome the sack and get a first down, but the Bulldogs continued to pressure Mettenberger and they finally forced an incompletion on 4th down to give the Dawgs the ball with 0:52 left. The Bulldogs escaped an entertaining hard fought game with another SEC win. Since losing to Clemson in the first game of the year, the Bulldogs have reeled off three wins and two of them were against tough SEC opponents. Georgia’s next opponent is the Tennessee Volunteers. Tennessee appears to have improved this year with a 3-2 record. However, they have not won an SEC game since 2011. This game should give us a better indication of exactly how good Tennessee is this year. LSU suffered their first loss of the year. They will now travel to Starkville to face the Mississippi State Bulldogs. The Tigers should be favored in this game, but anytime you play in Starkville you have to deal with the noise and the cowbells of the Bulldog faithful. 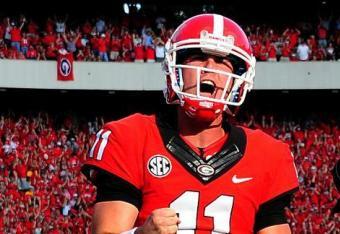 Aaron Murray, QB, Sr: Has started every game of his career. 45th start. Great on play action passes. Has a nice touch on the ball. Experienced. Team leader. Has overcome a stigma that he can’t win the big game against top 25 teams. Doesn’t have elite size, but he is more athletic than you think. Has a firm grasp of the offense, but at times he still makes silly mistakes. Completed 20 of 34 for 298 yards, 4 TD and 1 INT. Also ran for 9 yards and 1 TD. Michael Bennett, WR, Jr: Murray’s roommate and favorite receiver. Has the size to play outside, but he’s very good in the slot. Makes good adjustments to the ball in the air. Good hands. Had 3 receptions for 38 yards and 2 TD (5 yards and 21 yards). Chris Conley, WR, Jr: Good speed. Runs good routes. Works back to the QB on scramble drills. Comes back to the ball well. Shields off defenders well. Had a 25 yard TD and a 33 yard reception. 5 receptions for 112 yards. Arthur Lynch, TE, Sr: Has good size (6-5 265 pounds). Good across the middle. Moves the chains. Had 3 receptions for 40 yards. Dallas Lee, G, Sr: Two year starter. Does a good job pulling and trapping. Stays parallel to the line when trapping. Had a holding penalty. Ray Drew, DE, Jr: Five star recruit. Just now getting a chance to start. Former linebacker. Big and strong. Had 3 tackles, 1 tackle for loss, 1 sack, 1 QB hurry and 1 batted ball. Toby Johnson, DE, Jr: Quick off the ball. Had 1 tackle and ½ tackle for loss. Chris Mayes, NT, RS Soph: Playing in first career game. Good size (6-4 321 pounds). Active. Able to push the pocket. Had 4 tackles, 1 tackle for loss, 1 sack and 1 QB hurry. Amarlo Herrerra, ILB, Jr: Had 9 starts as a sophomore. Flows well to the ball. Had 6 tackles and one pass breakup. Ramik Wilson, ILB, Jr: First year as a starter. Runs well. Makes plays sideline to sideline. Had 6 tackles. Damian Swann, CB, Jr: Plays very tight coverage. Was beat on a 48 yard TD. Able to return punts. Had 3 tackles and 1 pass breakup. Connor Norman, S, Jr: Versatile player that plays special teams. Recovered a fumble on a punt return. Zach Mettenberger, QB, Sr: Improved with experience. Much more poised. Willing to stand in the pocket and take shots. Flourishing under the tutelage of Cam Cameron. Big arm. Can put the ball into a small window. Throws well on the run. Doing a great job of reading defenses. Able to throw a receiver open. Completed 23 of 37 for 372 yards and 3 TD. Kenny Hilliard, RB, Jr: Good downhill runner. Great in short yardage and goal line. 4 carries for 11 yards and 1 TD. Recovered a fumble. J.C. Copeland, FB, Sr: Former defensive lineman. Mauling lead blocker. Great short yardage runner. Converted a short 3rd down. Had 1 carry for 1 yard. Kadron Boone, WR, Sr: Had a great game after a quiet first 3 games. Benefitted from the attention given to Jarvis Landry and Odell Beckham. Had 2 receptions for 52 yards and 2 TD (4 yards and 48 yards). Jarvis Landry, WR, Jr: Had a big game. Very smooth athlete. Knows how to get separation. Runs good crossing patterns. Gets good yardage after the catch. Slips tackles in space. Extends his hands and catches the ball away from his body. Had 10 receptions for 156 yards and a 39 yard TD. Odell Beckham, WR, Jr: Great speed and athleticism. Has inconsistent concentration. Will make a spectacular play then blow an easy one. Very slippery in space. Dangerous kick returner. Does a good job blocking downfield. Had 6 receptions for 118 yards. Converted a 3rd and 23 situation. Had some big 4th quarter catches. Fumbled a punt. Jermauria Rasco, DE, Jr: First year starter. Spent two years backing up Barkevious Mingo and Sam Montgomery. Sheds blocks quickly. Able to create havoc in the backfield. Had 6 tackles and 1 tackle for loss. Anthony Johnson, DT, Jr: First year starter, but is the most experience lineman for the Tigers. Leader for the defensive linemen. Has good speed for a man his size. Athletic enough to drop into coverage on zone blitzes. Great instincts. 3 tackles and 1 interception. Ego Ferguson, DT, Jr: Big and physical. Good run stuffer. Gets his hands up on pass rush. Had 1 tackle and 1 batted pass. Lamin Barrow, OLB, Jr: Tackling machine. Had 104 tackles in 2012. Leader of the defense. Able to play inside or outside. Had 8 tackles. This entry was posted on October 1, 2013 by draftmaniacs in Scouting reports and tagged 2014 NFL draft, Aaron Murry, Georgia Bulldogs, LSU Tigers, NFL, NFL Draft, Zach Mettenberger.